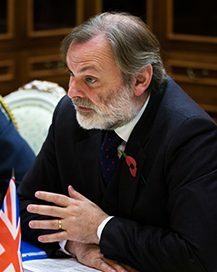 Theresa May appointed Sir Tim Barrow as Permanent Representative to the European Union, a position that already existed before Britain voted the leave the EU. Seated in Brussels, Sir Barrow will be mainly tasked with developing well-founded and sustainable relationships with other EU leaders and the institutions to make sure the Brexit negotiations proceed as smoothly as possible. Sir Barrow was previously the UK ambassador in Moscow between 2011 and 2015 and prior to that represented the UK in Ukraine as ambassador as well. He already has experience with EU procedures and decision-making as he started his foreign office career at the UK embassy in Brussels. He then went on to serve as private Secretary to Labour Foreign Secretary Robin Cook, where he advised on EU, Russia and Middle East policy. Sir Barrow’s appointment followed the resignation of Sir Ivan Rogers after he had been frustrated by politicians who disliked his warnings about the potential pitfalls in the Brexit process as well as the lack of a negotiating strategy. Very soon after Sir Rogers’ resignation, Theresa May appointed Sir Barrow, who was seen as a suitable candidate for both remain and Brexit supporters, as he had not advocated strongly for either side. Sir Barrow is known to have extensive experience in European affairs, but it has been noted that on technical subjects, such as financial services, he might lack knowledge that will be essential to the UK’s negotiation objectives.